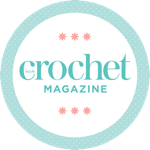 This week has been all about Tunisian crochet – I’m working on a couple of pieces which I’ll be sharing with you soon. It’s been a quiet week of commuting and crafting – with a lovely yarn delivery to keep it interesting. That’s all for this week – got a few ta-dah moments coming next week which I’m really excited about! I agree with you, the ‘wrong’ side of the mandala does look really pretty- I guess because it’s outlined with white instead of black, it looks fresh. And your crochet looks amazing! I love that blanket your pup is snuggling under.